The death toll from clashes in Egypt on Saturday's anniversary of the 2011 uprising has risen to 64, Egypt's forensic authorities' spokesperson told Ahram Online. The toll on 25 January only includes those in Cairo and Giza, spokesman Hisham Abdel Hamid said. Post-mortem examinations showed at least 58 of the deaths were caused by gunshot wounds and one by birdshot, Abdel Hamid added. On Saturday, the third anniversary of the popular revolt that toppled autocrat Hosni Mubarak, deadly fighting erupted between police and supporters of deposed President Mohamed Morsi and some non-Islamist protesters in several parts of the country. In east Cairo's Mattariya district alone, 26 were killed when police violently dispersed a demonstration by Morsi supporters. 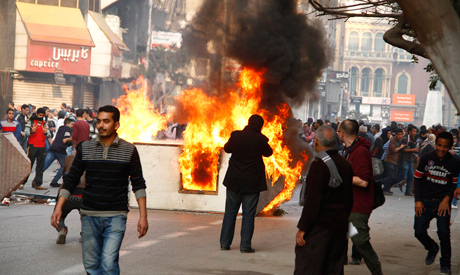 An April 6 youth movement member was shot dead when police dispersed a downtown Cairo protest opposed to both the military and the Muslim Brothhood. The violence highlights deepening polarisation since the army's ouster of Morsi in July after millions protested against his year-long rule. On Friday, a string of bombings targeting police in Cairo and the neighbouring Giza governorate killed six people and injured dozens. The recent spate of violence has raised fears that Egypt could see the re-emergence of an Islamist insurgency that battled with authorities in the 1990s. Round them up and send them to camps for de-programming them. They are brain-washed and lost touch with realities. Mr. Morsi is US agent embedded in the Gov. to expose BH. Do you really want him back to split the country? IDIOTS.